I sure hope you're enjoying this journey through Proverbs 31 as much as I am. I’m super excited to continue this week with one of my fav topics, marriage. Let’s take a look at the next two verses. So the absolute first attribute we see of this woman is that her husband has full trust in her. I think the King James Version is beautiful, it says The heart of her husband doth safely trust in her, so that he shall have no need of spoil. So not only does he trust her with his money, his children and basically his life...he also trusts her with his heart. Oh trust, can't we all agree that is such a crucial part of marriage! Being trustworthy is such a blessing to your husband. How do we become more trustworthy? By mirroring God. I was intrigued by the KJV version and what no need of spoil meant, so I dug a little deeper. Basically, he knows that his trust is not misplaced. He knows his wife would not do him wrong, ever. Which ties directly into the next verse. She brings him good, not harm, ALL the days of her life. It doesn't say she only is good to him when she feels he deserves it. All the days of her life y'all. Every single one! In our world, 50% of all marriages end in divorce. But for the Proverbs 31 woman, she is in it for the long haul. For better, for worse...for richer, for poorer...in sickness and in health...all the days of her life. She remains faithfully at his side. And he has confidence that she will always be there. This beautiful lady strives oh-so-hard to make her home a haven of joy and happiness for her husband to return home to at the end of the day. There is a quote by Martin Luther that I love...let the wife make the husband glad to come home, and let him make her sorry to see him leave. That quote is a perfect example of a Proverbs 31 wife. She doesn't love her husband with conditions and she doesn't hold grudges. How many of us can say that? Surely not this strong-headed girl. Forgiving love is a love that is securely rooted in God's love for us. God wants our love to be sweet, soft-hearted and lovely. He wants it overflowing with forgiveness. By offering forgiveness, we are offering the grace that God has given us. The Proverbs 31 wife doesn't cling to prior offenses, tucking them in her pocket to use later. She wipes the slate clean as soon as the offense happens. She knows that will not only set her husband free, but her as well. 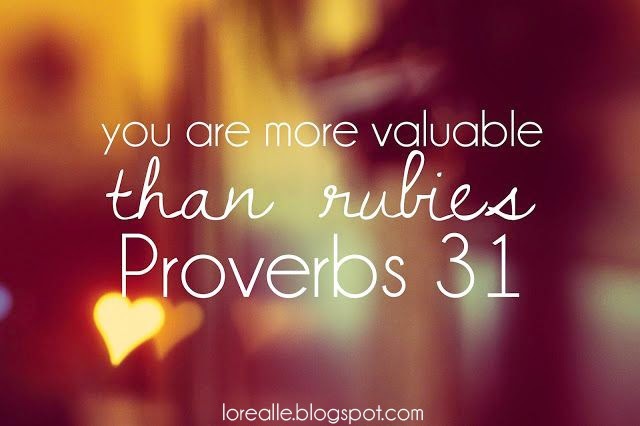 Don’t forget to stop back next Sunday as we take a look at more virtues of the Proverbs 31 woman.